President Rajapaksa concluded a two-day state visit to the Maldives and arrived in Seychelles yesterday. President Michel, beginning the talks, said he was pleased to welcome President Rajapaksa to his country for the second time. Following President Rajapaksa’s visit to Seychelles last year, there has been a remarkable improvement in the bilateral relations between the two countries, President Michel said. “Your present one is another step forward,” he added. President Rajapaksa, thanking Seychelles for the warm hospitality extended to him and his delegation, congratulated Seychelles for its 38th Anniversary of Independence, which falls on July 28. 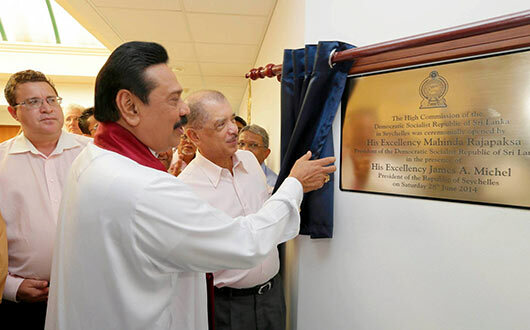 President Michel’s visit to Sri Lanka in August 2010 greatly contributed to expanding bilateral relations, President Rajapaksa said, adding that the opening of the new Sri Lankan High Commission in Seychelles, the Bank of Ceylon branch and the Sri Lanka Insurance branch are testimony of that. 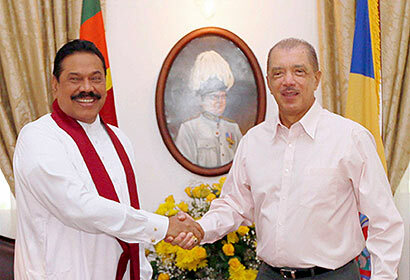 President Rajapaksa, expressing hope that future bilateral relations would reach to a new level, invited the Seychelles President to visit Sri Lanka. President Michel also agreed that relations are at a satisfactory level. “Ours is a win-win partnership. We can learn a lot from Sri Lanka. We are ready to continue the relationship with Sri Lanka,” President Michel said commending Sri Lanka for raising common issues faced by the developing countries at international fora. Following bilateral discussions, the two presidents proceeded to a one-to-one meeting, and Vice President of Seychelles Mr. Danny Faure and Minister of External Affairs Prof. G. L. Peiris also proceeded for discussions. Agreements that are signed today will create a strong platform for relations, Prof. Peiris said. He further said that Sri Lanka can provide training facilities for teachers for the development of education in Seychelles. As ocean nations, both the countries should prioritize enhancing “blue economies,” he added. The Seychelles Education Minister will visit Sri Lanka this week to explore the areas of assistance while the Minister of Health is schedule to visit before the end of the year, Vice President Faure said. He commended the maritime training provided by CINEC Maritime Campus to his country’s youth. Expressing views on trade between the two countries, Monitoring MP of the Ministry of External Affairs Mr. Sajin de Vass Gunawardena requested to provide facilities for Sri Lankan pineapple exporters. Maximum benefits should be reaped from the investment forum organized by the Sri Lanka Export Development Board in Seychelles in October this year, Mr. Gunawardena pointed out. Mr. Rajatha Piyatissa were also present at the discussion.